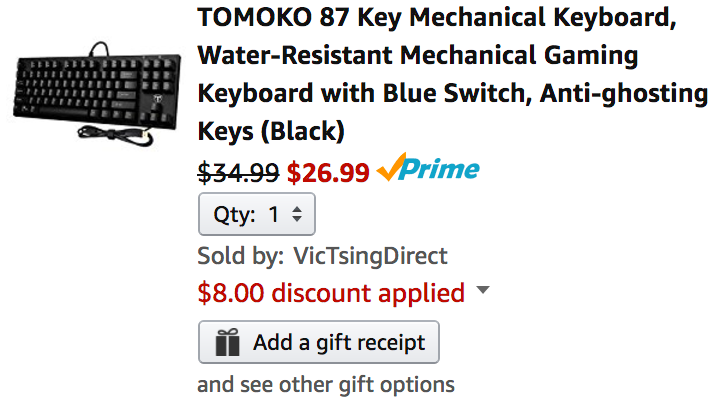 VicTsingDirect (99% positive feedback from over 92,000) via Amazon is offering the Tomoko 87-Key USB Mechanical Keyboard w/ Blue Switches (VS1-PPC023B) for $34.99, but if you use the code 5MRHIBWG the price will drop to just $26.99 Prime shipped. That’s $8 off the regular price and the lowest we can find for it. Rated 4.4/5 stars by over 500 Amazon shoppers. N-Key Rollover. With anti-ghosting 87 keys, this Mechanical Gaming Keyboard allows multi-keys to work simultaneously without confliction, experiencing a new level of gaming and typing. Ideals for gamers, typist,programmer, writer etc. Blue Switches. Provide you“clicky” tactile feedback to improve typing speed and accuracy. Give you an edge over competitors with accurate response. 50 million times keystroke test, 60±15g key force and 4.0±0.2mm stroke travel. FN Shortcuts. Easily access to media controls, such as play, pause, next and previous track, calculator, email, web browser etc without exiting game. Build Quality. Made of top-grade ABS and metal base, with matte-finish texture,it is sturdy and robust for durability. Laser-engraved keys are not easy to fade. Water-resistant with drain holes. Ergonomical Design. Cascading keycap design fits your palm easily to prevent fatigue. Suitable for Windows10, Windows8, Windows 7, Windows XP, Windows VISTA etc. Backed by 45 days money-back and 12-month worry-free warranty. Mechanical keyboard is a perfect companion for typist, gamer, programmer etc. Use it in games to precisely control your movement speed and turns, helps you win in the game. When typing, the audio feedback will help you to increase typing speed and accuracy. “Clicky” Feedback Using blue switches, it delivers a satisfying audio feedback of every single click. Help you take full control over your game and experience a new level of gaming. Media Shortcuts Give you a quick access to dedicated media controls, such as volume, play, pause, next and previous track, calculator, email, web browser etc. Durable Keys can bear 50 million times keystrokes. Made of metal material, with matte-finish texture, it is sturdy and robust enough to protect it from scratch , bump and corrosion. Complimentary Key Cap Puller Tool We offer you a key cap puller for free. With this gadget, you can pull your key caps easily when you want to clean your keyboard or frequently change your key caps. Non-slip Design Under the keyboard, there are two rubberized holders to prevent it from slip.